Home Learners supports learning using a wide variety of resources and strategies to develop an individualized learning plan for each student. 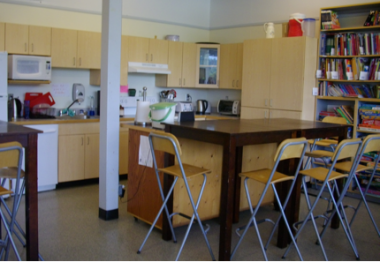 Our Bistro/Resource room is a multi-purpose space that incorporates a kitchen, part of our library for family use, a toddler area, a photo copy centre, and a general meeting place. Parents and younger siblings are always welcome to use this area while their children are in classes. It allows opportunities for parents to share ideas and community events, plan activities, hold PAC meetings, and be on site to support their children. The Resource library offers a variety of materials to support student learning. Parents and students are welcome to browse and check out materials, which include text books, workbook samples, novels, games, puzzles, science kits, thematic units, and manipulatives. Our resource library has expanded to house science equipment in the Green House, and Math Manipulatives, games, International Languages, and a parent library in the lower level of the Learning Centre.